We are pleased to announce the release of our book, “Mastering Agility, Successfully Navigating Uncertainty”. Written for the hands-on manager wishing to tackle today’s increasingly shorter business cycles, unavoidable megatrends and the perfect storm most sense is coming. 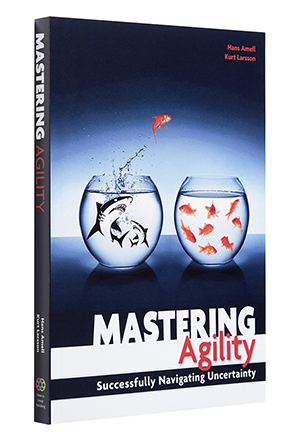 Written by former McKinsey management consultant/Minerva chairman Hans Amell and communication expert/Minerva board member Kurt Larsson, Mastering Agility provides simple, practical management tools to positively navigate through our increasingly uncertain future. It explains why you, your management team and every single person associated with your organisation need to get agile or die trying! With a forword from the renowned In Search of Excellence author, Bob Waterman, Mastering Agility has already received praises from recognized business leaders from Ericsson Telecom and Astra Zeneca’s Leif Johansson to billionaire investment guru Tom Gores.